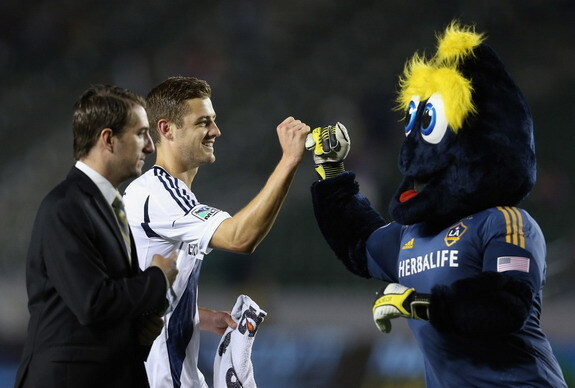 Gay rights in football received a massive boost on Sunday after Robbie Rogers, the first openly gay male athlete in American team sports, made his debut for the LA Galaxy. Three months after retiring from the game following his gay announcement, Rogers bravely decided to come back into the game by joining the Galaxy just a couple of days ago. On Sunday night, Rogers made his first appearance for the reigning MLS champions, and the reception he received was magnificent. The 26-year-old entered as a substitute in the 77th minute with the Galaxy leading the Seattle Sounders 4-0, which turned out to be the final score. He received loud cheers from the crowd of 24,811 at The Home Depot Center as he ran onto the pitch, with fans chanting his last name. Rogers ran by teammate Landon Donovan, who slapped his hand and patted him on the back as he took his position. "If you were to see my face I just had a huge smile of enjoyment, of, 'this is OK, I'm back, this is normal.' This was great, very supportive," Rogers told a press conference. "And once I got on, and obviously (got) the support, I just kind of zoned in and was hoping to maybe get a goal or something. "So, it's just good to be back and I'm excited to move on from here." The former Leeds United midfielder touched the ball a couple times in the closing minutes of the victory that ended the Sounders' three-game winning streak. Rogers added: "I was happy to get a few touches. I thought my running felt pretty good, I felt like I hadn't lost too much speed. "It was just good to be back so that I can get my feet wet." Now that the debut is over and the roar of the crowd has subsided, Rogers must begin his focus on becoming a vital contributor for the Galaxy. He said: "It's back to the grind of finding way to be successful and kind of getting that edge above other athletes."